Not a sales guy, Miles. Just don’t understand why someone who admittedly has no need for a diesel would buy one and submit themselves to the added maintenance cost and purchase price of one. Especially when you can buy an f150 or any other brand half ton gas truck that will tow a lot, cost less money to purchase and less money to maintain. And I guess I was wrong. It’s rated to tow 13,200 pounds. Not 12,000. 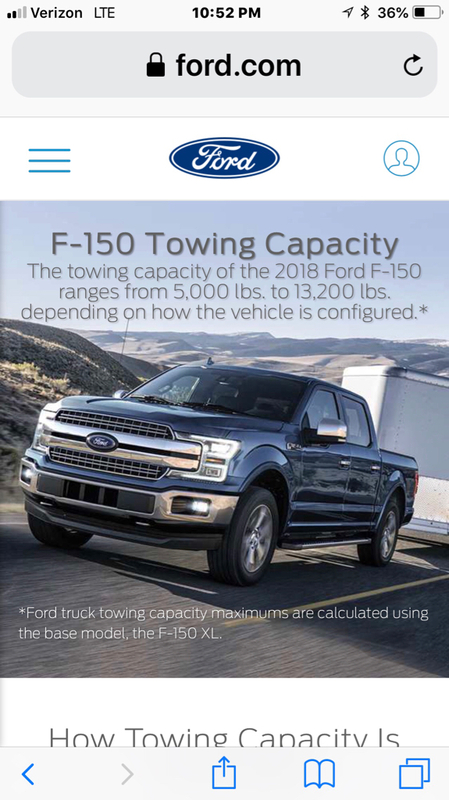 So you’re saying if I have an 11,000 lb 5th wheel that I tow I should be fine with an f-150 and its half ton frame and half ton brakes and half ton transmission. As long as it’s under 13,200 I have no need for anything larger. I beg to differ and if you say that’s not what you said than you better reread your post. I imagine in order to advertise this towing capacity they are required to build a frame, braking system, a trans to handle that load. You need to stop thinking of this truck as a 1/2 ton. If I’m remembering correctly, the standardized towing test does not factor in braking. It’s basically a hill climb. They don’t care what happens after you reach the top. Sorry, it does... just has to stop the truck and trailer at a speed of 20 mph in 80 ft or less. Doesn’t say anything about stopping a 13k 5’er on a 6% + downhill grade. Lol. It primarily focuses on speed and acceleration. Isn't that what the runaway gravel ramps are for? So the lawyers at Ford allow them to rate a towing capacity based on a hill climb? Doubt that. There is a massive amount of engineering involved in what they want to get out of these trucks. These companies aren't going to advertise something this truck can't handle safely, that's financial suicide. Miles.... what truck do you have? Read the towing standard linked in the post below yours. Then tell me how far off I am... I tow 12-15k regularly. A couple years ago I did a lot more research then the weekend warrior trying to tow a 5’er with his f-150. Unless things have changed, I stand by my initial post on what they focus on. While I won't argue that your Duramax is a better tow rig then the F-150, the link you mention does provide Brake Testing. The only dog in the fight I have, is that a Cummins is better than a D-max - but I'll leave it alone. I said it’s rated to tow that much weight. How it does I have no idea. 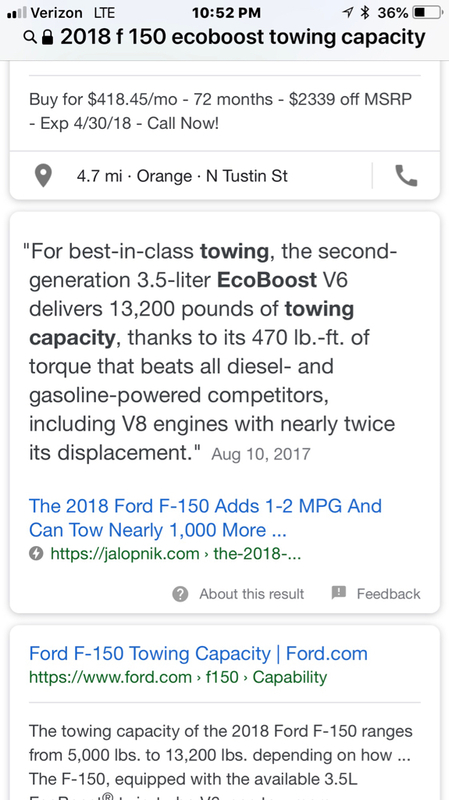 Totally not the point of the thread though either, but since it’s now jacked, if a truck is rated to tow X amount of weight, how is it not capable of towing X amount of weight? For the record I’m a huge fan of overkill when it comes to towing. I don’t think I’d ever want to tow 12k with a 1/2 ton truck. But the truck is rated to tow that much. So that means the frame and the brakes and the cooling system and everything that goes along with it is designed to handle that much weight. Sure the gas rig will tow some weight, but all things equal on the heavier end of towing, I’ll bet the diesel far outlives the gas rig that was tached out on every hill. I don’t see gas powered semi trucks all over the place. Think about that for a second if you plan on towing. I’ll stick to my diesel. Here’s the mileage for a morning commute to work, mostly hwy. 3/4 ton. I check periodically and the computer system has never been off more than .6 mpgs. I’ve never towed 12k pounds in my life. Maybe 7000-8000 a few times. But that’s not my point. I am entertaining the idea of a new (to me anyway) truck. I do tow a few times a year but not so much that it's a major factor. It sounds like they are both pretty solid motors. What are your experiences with these two options? Fuel economy, life expectancy, etc. Here’s the original post in the thread just for keeping things on track. Yeah I read that. I can't help but think there is more to it than that. Like proving frame, and braking engineering. Maybe not, but I sure hope so. Especially considering how many guys are out there towing well beyond a trucks capacity. Im gonna drop my 2c in here because im quite certain that there are only a couple of other folks that may have put more miles on towing behind a pickup than me. Braking is less of an issue for the half ton because if the electric brakes work on your trailer they do most of the work. If you want to be concerned about the hauling capacity worry about keeping the transmission cool, since the f150 is going to be a juice box. While a gas engine isn't as efficient as a diesel, it will work for the occasional use. Many folks forget about the gas engines used in many for the F series dump/delivery trucks of the 70s. Going back and forth over the pass would be hardest on the truck, but once again this has more to do with the transmission than anything else. Using a truck at max capacity occasionally is one thing. Using it several times a week is something else. I wouldn't hesitate to use a gas truck to haul capacity up and down the I5 corridor, or the occasional trip over the pass. It will take longer, and be less efficient. The real question becomes how often, and how much. But this thread is about a truck that will be used to possibly tow a few times a year. That was 2 pages ago, so can't we derail? Page created in 0.126 seconds with 46 queries.